a narrow strip of cartilage located between the lower edge of the cartilage of the nasal septum and the vomer. Synonym(s): cartilago vomeronasalis [TA] . 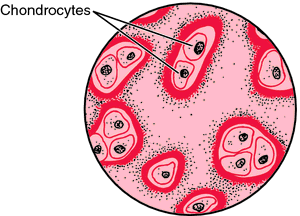 a specialized, gristly connective tissue present in both mature animals and embryos, providing a model in which most of the bones develop, and constituting an important part of the organism's growth mechanism; the three most important types are hyaline cartilage, elastic cartilage and fibrocartilage. Also, a general term for a mass of such tissue in a particular site in the body. the cartilages of the wings of the nose. a ring of cartilage interposed between the rolled-up auricular cartilage and the skull. that clothing the articular surfaces of synovial joints. two pyramid-shaped cartilages of the larynx. cartilage of the pinna and much of the external ear canal. tunnels containing blood vessels incorporated in developing cartilage. that connecting the surfaces of an immovable joint. a bar of hyaline cartilage that attaches a rib to the sternum in the case of true ribs, or to the immediately cranial rib in the case of the anterior false ribs. a ringlike cartilage forming the caudal part of the larynx. the ungual cartilages of the third phalanx in the horse lie mostly against the hoof wall but can be palpated if ossified. See also sidebone. cartilage that is more opaque, flexible and elastic than hyaline cartilage, and is further distinguished by its yellow color. The ground substance is penetrated in all directions by frequently branching fibers that give all of the reactions for elastin. a detached portion of semilunar cartilage in the stifle joint. see distal phalangeal cartilage (above). flexible, somewhat elastic, semitransparent cartilage with an opalescent bluish tint, composed of a basophilic fibril-containing substance with cavities in which the chondrocytes occur. an occasional cartilage located between the two arytenoid cartilages. rostral end to the internasal septum, separating the nasal cavities and anchoring the other cartilages around the nostrils. cartilaginous plates medial and lateral to the patella in some species, e.g. dogs. 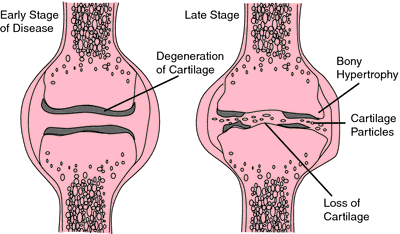 cartilage that does not normally become ossified. occur in ulnar metaphysis and lateral femoral condyles of young, giant breed dogs. Visible radiographically as radiolucent inverted cones, extending into the metaphysis, they are often associated with growth deformities such as forelimb valgus and genu valgum. dorsal extension of the scapula in ungulates; tends to calcify with age. used for ear cropping in dogs. one of the two intra-articular cartilages of the stifle joint. cartilage that is normally destined to be replaced by bone. the unpaired cartilage of the larynx to which the vocal folds attach. the bed of cartilage located on the caudal surface of the intertarsal joint of birds; the tendons of the digital flexors pass through it. either of the two narrow strips of cartilage, one on each side, of the nasal septum supporting the vomeronasal organ. posterior continuation of the sternum; supports the anterior abdominal wall, especially the linea alba.